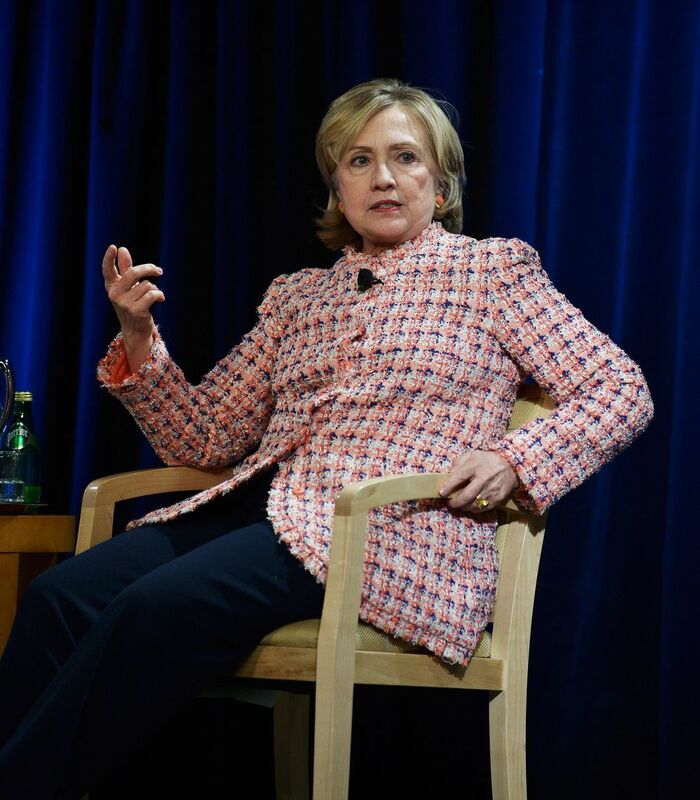 (Via New York Times) A federal judge on Friday ruled on behalf of Citizens United, a conservative advocacy group, in its lawsuit against the State Department for documents related to Hillary Rodham Clinton’s tenure there. The group requested the flight manifests to examine whether Clinton Foundation donors had accompanied Mrs. Clinton on State Department trips. “Clearly, the State Department is not getting the benefit of the doubt from judges anymore,” David N. Bossie, president of Citizens United. said Friday. This entry was posted in Clinton(s), Conspiracy ?, Dem Hypocrisy, Professional Idiots, propaganda, Secretary of State, Typical Prog Behavior, Uncategorized. Bookmark the permalink. Senior status Clinton appointed judge known for an inability to think clearly. Don’t get your hopes up. It takes a long time but you can eventually get them. Reading the link provides a clear case for a better way to vet Federal Judges. Sounds like a Federal Judge Nelson. Dwell long on first picture. Gollum searching for lost Preciousss. This is who Demo’s want to run country for next two POTUS cycles. Slick Willie could not match this woman. Deviant. Am I amazed at the red diaper babies running our government? No. One question: Does she look like a good president? Does she hide the truth? Is she open and honest. Does she do – what she has accused others of having done (i.e., hiding emails, etc.) You want this type of arrogant person for president? Not me. I guess Obozo and ValJar authorized the judge to demand the records. Yeah, they are really making her squirm. And I’m LOVIN’ EVERY MINUTE OF IT! I wonder what’s coming up this summer where the Admin wants as many attention spans diverted from the half-White House as possible? Great! Maybe bring Hillary down a little may just make others in Gov to start complying with our laws. At least I can still dream. The upcoming drips are bound to be detrimental to Dame Hilary’s campaign. She and her minions can yell ‘right wing conspiracy’ all they want, but that will only remind folks that she made that same excuse during all her and Bill’s myriad scandals. With several different organizations going after her emails, this ought to be good! From what I gather she has turned everything over to the State dept except for her personal e mails which she says she deleated. Therefore the State dept will have to turn over any e mails because she no longer has any! See how this works? She no longer has to produce anything. Anything not turned over now belongs to the State dept. Right and Psaki has already said it will take State MONTHS to review and REDACT CLASSIFIED INFO (tho Hill said she didn’t email classified info) before they can release the emails. Slow rolling at it’s finest, Clinton style. The months it’s gonna take for the various new State Dept.FOIA requests coming from mutiple organizations is the slow drip I’m talking about. Some of these requests are not coming from folks on the Right (the Associated Press, for example) so the accumulation of these efforts and the frustrations concerning the ‘slow walking’ obfuscations from State will add weight to this scandal. If she’s deleted her personal stuff, there’s no reason she shouldn’t hand over the server. 1. Any classified material in the emails, or material that should have been classified. The unclassified and classified systems have to be kept separate. See handling of General David Petraeus US Army (retired), who plead guilty to a misdemeanor for mishandling classified material. But even the SECSTATE travel plans can be classified, particularly for overseas travel, for security reasons. That is generally why things are kept on the high side, while she apparently did not maintain such electronic access. 2. Any documentation for emails that were not provided. For example, an email that was not provided from person 2, when there is an email from person #1 to Hillary which references a previous message from Person #2 to both of them. The answer can’t be “I guess we inadvertently deleted it”. That is why the block delete method can cause problems. This will take people to cross check the emails one by one. Probably why the information was sent by paper rather than electronic media, since it will be harder to do manually. But it can be done, and it won’t take missing emails to be a big problem. 3. Inability to provide a copy of the document for the briefing for the end of access to classified material (there is a name for it, but I don’t recall it). If the briefing was done and documented, Hillary would have pulled it out already, so the bet is that it was not done. Evidence for “Not required for a Clinton and future President”. Also an embarrassment to the President, since it was his responsibility as well. 4. Evidence for embarrassing connections/overlap between the Clinton Foundation and Hillary’s work as SECSTATE. The presence of much of a connection would allow Congress to subpoena all the files from the Clinton Foundation., like donor lists, meeting records, etc. Even Bill could be dragged into that inquiry for more clarification on the meaning of “is”, or perhaps “was”. Our only hope, truly, is that Obozo and ValJar are encouraging this and will not interfere with this investigation. I think there is enough to sink the Clinton’s, the question is whether the information can be dug out. That picture depicts her very well, as a wicked woman. She has a queen mentality and needs to be taken down a notch or two. Sunlight will be what brings her down. Hillary has done some good things in her life that was not for the news or the votes. I’ve seen another side. It doesn’t excuse all the wrong. But I’ve also seen some good. Then perhaps she should stay out of the news, not run for office, and do her “good” as a private citizen. She can’t be trusted to be my president. It would be nice to see her with egg on her face. Was Obozo someone you could trust? Absolutely not and I don’t trust her either. Al Capone was good to his Mom? Hitler was good to his dog. Yeah, “We came, we saw, he died”. That one? I was stunned when she got a pass on that. Never heard anyone rebuke her for that. Beyond bizarre. Monroe, please give us some illustrations of “good things” Hillary Rodham Clinton has done and how they can in any way make up for her lies, deceit and enabling of fascism. And, the loss of life that surrounds her like gnats on a hot day in Georgia. She has good taste in clothes, uh no, wait, never mind. Actually on another woman, this jacket would look good. It’s not right for her, even if it did cost muchos buckos. I like the texture and style. Lose the pants with it, though. It would look super with a skirt in whatever the light color is. Does she not own a dress or skirt? References, please? List them, do you mean donating Bill (BJ), as governor his underwear, then taking a tax write off. ……… I’m waiting……..
Is Hillary Clinton Going to Slide Through Every Scandal That Surfaces? Zo sets the record straight Why Hillary’s “email gate” Will Not Harm Her. This is All That Really Matters.! I do take issue with his point at the end. The public has been conditioned to believe the liberal way is just ‘normal.’ If you say ANYTHING not in line with the liberal view, they are automatically conditioned to view it as extremist, hateful, bigotted, and evil. Even supposedly conservative people are sucked into this. In fact, I think his last point is an expression of that. He says the way the message is being delivered doesn’t have salt. It’s impossible now. I a world filled with lies, the truth becomes revolutionary. And that is the plight. USA loving people will always need to speak against what has become ‘normal’, because the ‘normal’ is wrong. Most republicans I come across are no more smarter than the liberals. They are just as dumb and just as indoctrinated. Right now, on FB, my aunt is ranting about them taking prayer out of schools and angry because they are removing religious symbols from public places, and angry because they are taking the American flags out of the schools. She posts about supporting police and our troops, about gun rights, and even about illegal immigrants, etc…. But she also posts repeatedly how great of a President Obama is and always votes democrat and defends democrat politicians. How could you EVER say anything at all that will relate to people like that? Those who consistently vote democrat yet complain about issues that are directly a consequence of a liberal ideology, you will never say anything that will possibly relate. And I agree nowdays people who consistently vote republican offers no assurance of not being just as dumb and “indoctrinated”. It really is sometimes just a choice of the lesser of two evils.